You are here: Home / Business / Would you trust an ICE Driven Lift? Petrolhead man/woman/person is a strange beast worshiping at the foot of Mercury believing that the only true way to mythical speed and reliability is through the Internal Combustion Engine (ICE in the parlance of the hemp wearing hipster Electric Vehicle brigade). Hours spent tinkering with heads, pistons, mapping, mix and other arcane stuff is seen as a right of passage. The more fossil fuel and higher the consumption in the pursuit of speed is seen as a badge of arrival. Breaking the engine and building it again is acceptable, nay, demanded. And yet those very same fossil fuel killers demand the exact opposite from an Electric Vehicle – the main gripe being that the range must equal that of a vehicle with an engine capacity a tenth of the size of their gas guzzlers. The next gripe is that the electric engine is not strong or reliable enough. And yet these very same guys will get into a lift and trust their lives and the lives of their misshapen offspring to an….. electric motor. Whilst we are talking about Man Member Envy lets compare the the worlds largest electric and diesel engines with one another. The installed 101 MW NTF Drive Motor. A 101 MW (135 443 horsepower) variable speed motor, built by ABB and installed in 1995, drives a supersonic wind tunnel at NASA’s Langley lab in Hampton Virginia. 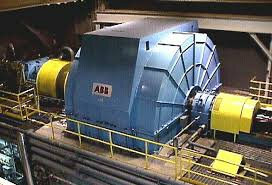 The 365-ton motor was manufactured by ABB at their works in Birr, Switzerland. Excluding its coolers and other accessories, the ABB motor occupies a space 3.65 meters long, 6.1 meters wide and 7 meters high. The 109 000-horsepower (81 MW) Wärtsilä-Sulzer RTA96-C weighs in at 2 300 tons, and is 13.4 meters high and 27.4 meters long. See girls – sometimes bigger is not necessarily better.